The following is a rumor that has been officially dismissed and remains here purely for historical purposes. Please do not treat it at as fact. All sets since BT06 have included an English subtitle below their original kanji, and all sets since BT01 have included furigana above said kanji to act as pronunciation guides. 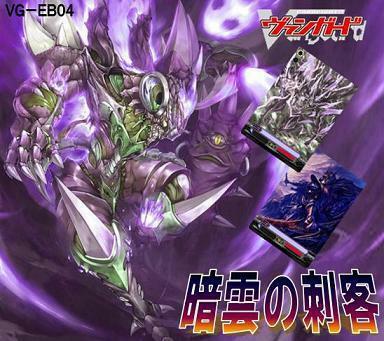 The set image itself appears to be a poor photoshop, as the font for VG-EB04 lacks the white outline of previous sets, and Bushiroad's copyright information is not present anywhere in the image. Clan text for unrevealed cards always uses the United Sanctuary's orange, while the cards shown in the image use the Dragon Empire's red. Nubatama itself has been purposely replaced by Murakumo. ZANBAKU, FUSHIMI and the Arrestor series--which were originally Nubatama cards in their manga debut--were converted into Murakumo in Comic Style Vol.1, and Bushiroad has been pushing for Murakumo to be the only ninja clan ever since. Hand control itself, while not currently overpowered in any way, is a dangerous mechanic to play with and possibly too difficult to make truly balanced if given to a complete clan. As templates for fan-made cards have been circulating for some time now, the cards in the EB04 image cannot be taken as evidence of the image's authenticity.